Our range of shrink wrapping machines are used for sleeving of pharmaceutical products, electrical capacitors and others. These are incorporated with air circulation fan and electrical elements. Further, our range is easy to install and can provide efficient performance at client's end. 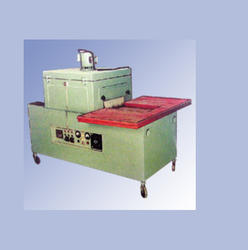 We offer shrink wrapping machine, which is a single zone heating chamber with the conveyor for product movement. These are fitted with hot air circulation fan at the top. Further, our range is also incorporated with electrical elements for heating purpose.